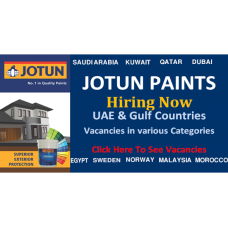 Jotun is one of the fastest growing paint companies in the world. We cover the entire value chain within the organisation. You might want to be a part of our future. Will you let us be a part of your future too? Jotun is one of the world's leading manufacturers of decorative paints, marine, protective and powder coatings. The Group has 64 companies and 40 production facilities around the world, and more than 9 800 employees. Jotun is represented in more than 100 countries through own subsidiaries, joint ventures, agents, branch offices and distributors. The Jotun Group's sales in 2017 was NOK 16.4 billion. The Jotun Group is organised into four segments and seven geographical regions, and has its head office in Sandefjord, Norway.